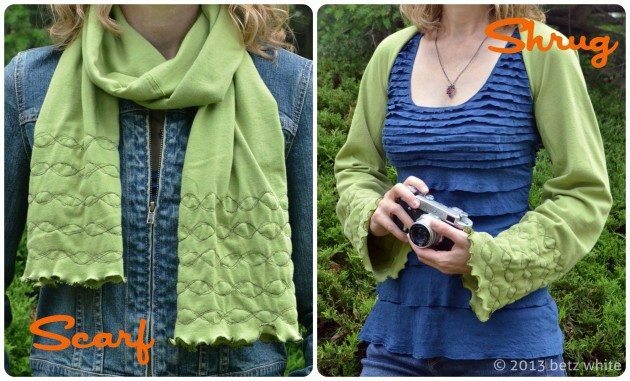 A few years ago I shared this tutorial for a scarf that can also be worn as a shrug. It’s great for Spring, made in a jersey knit with lettuce edge detail. But, oooh, what about fall? I’m eyeing some great sweater-knit fabric out there, thinking about making another. Maybe with wider sleeves. What do you think? This is so cute and unique! Maybe wider overall? Thanks! Yes, that’s actually what I meant. Wider overall, making wider sleeves when in shrug form. great idea, I might try it but personally I wouldn’t make it wider for me but it is all about the look you want for you.